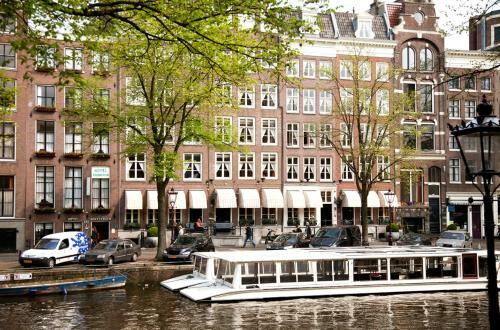 Hotel Estheréa is set along the Singel canal in the centre of Amsterdam, only 300 metres from Dam Square. This hotel is in a quiet area and benefits from classically-styled decor with wooden paneling. Free WiFi access is available. Each of the stylish rooms are romantically decorated and have a private bathroom. Some rooms have a canal view. Guests are able to borrow an iPad free of charge at the reception desk during the stay in the hotel. Breakfast at the hotel features an extensive range of choices including bread, toppings, juices and fresh fruit. There are also warm dishes including scrambled eggs, boiled or fried eggs, sausages and bacon. The hotel serves coffee, tea or hot chocolate free of charge in the lounge with canal view. Furthermore, you can make free use of the wired internet in the lobby, visit the small library and get colouring books for children. Hotel Estheréa is situated in the heart of the city centre within walking distance of museums, the main shopping area and night life. You will find plenty of cafés and restaurants in the area. Everything was wonderful...too bad we were only there 2 nights. Martin at the front desk was a welcomed joy on arrival. He had the answer to all our questions and he was absolutely delightful. Very comfortable, nice interiors, friendly and helpful staff. The air con vent was very loud. Rooms were very nicely decorated, reasonably spacious. This hotel was FANTASTIC!!!! As we approached in our taxi I worried about its simple outside appearance among the buildings along the canal....but as soon as we entered the front door my mouth opened in astonishment!! The simple exterior belied the beautiful and luxurious foyer with its chandeliers, soft comfy sofas and FREE tea and coffee facilities and lots of FREE sweets and goodies. The staff on the desk was excellent....helpful and very friendly. We didn't meet any of the other staff as we didn't dine in the hotel....we thought the breakfast was a bit pricey for our needs and instead had breakfast in Starbucks each morning. The price of the room was a bit dearer than I normally would pay but it was well worth it!! Beautiful, clean, luxurious and a very comfortable bedroom.....every need taken care of. We LOVED it!!!! It was quiet also...no noise at any time. I would DEFNITELY stay here again. The receptionist told us it was 3rd generation family owned...…...you could see the added extra personal touches because of that. Its not part of a large generic chain so there was an ambience and special touches that you won't find in a massive hotel group, I think. The standout extra was the free tea/coffee/hot chocolate...etcetc available ALL day on tap in the foyer........along with the goodies too!!!! What an easy thing to do but so different and special.......I've never seen that in any other city/hotel and I'm 57 years of age and well travelled. Other hotels could take a lesson from Hotel Estherea on giving something extra for free that makes the customer feel happy …..and appreciated!!!! Definitely I recommend that you stay here when you visit Amsterdam. I give it full marks (Maybe knock off a few points for the price!!) It is also very close to Dam Square........just a few minutes walk to the centre of things. It was wonderful and I was sorry to leave. Thank you Hotel Estherea. Great location, cozy atmosphere and welcoming interior. Love the common areas with several lounging areas, free coffee and nice library. Lovely entrance with a nice bench where one can enjoy the canal view in the sun. we have stayed here before and love that all the rooms are different and very upscale . We love everything about this hotel. Martin and his front desk staff and all of the bar and breakfast staff were amazing. We had a unique situation in that we arrived in AMS after our Viking Sky cruise was cancelled. Viking and Estherea worked beautifully together to make our experience warm and welcoming. Customer service is outstanding ! Kudos! The staff were excellent. The complimentary drinks and snacks were a lovely touch, the bar snacks and cocktails were excellent, and the location was perfect. Will definitely return. Beautifully decorated, close to everywhere. Thanks for the upgrade! Housekeeping staff very grumpy about cleaning our room as we had come back for a rest at 3.30pm and they wouldn’t come back later in the day. Said they were going off shift then which is more a fault of the management. We always come back to our room mid afternoon for an hour and cleaning staff have always seemed perfectly willing to do it later so this is a first.